Sparkling bays glisten in the sunlight over picturesque sandy coves. Exotic rainforests burst with the vibrant hues of tropical flowers and vegetation. 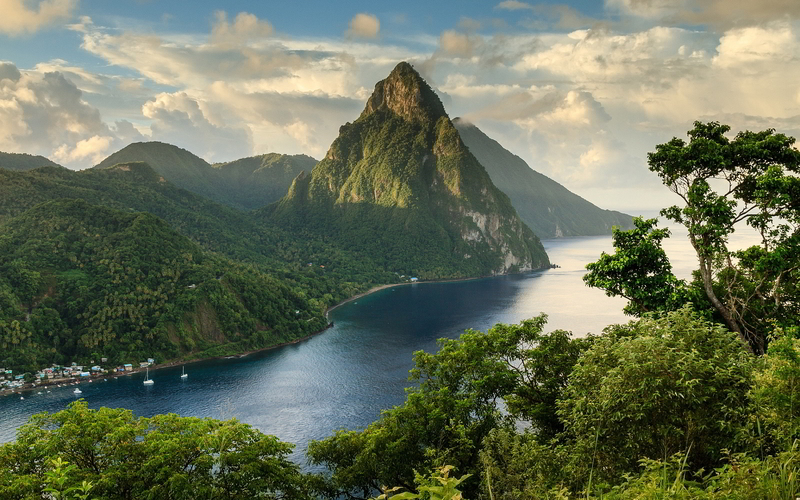 The “Twin Peaks” of the Pitons rise magnificently from the sea. The west coast is home to stunning reefs and wrecks, ideal for snorkeling and scuba diving, while the southern part of the island features mile after mile of banana plantations, tropical rainforests, and other natural wonders. Largely untouched by time, St. Lucia truly is “Simply Beautiful”. Visit Marigot Bay, a lovely, sequestered, natural harbor that once provided a hideout for pirate ships. Marigot Bay has served as the setting for numerous major motion pictures. Whale and turtle watching are popular in St. Lucia. Over 20 species of whales are regularly spotted throughout the year. The abundance of turtles on the island is due to the protection provided by local environmentalists. A variety of natural trails through St. Lucia’s majestic rainforests lead hikers to the top of St. Lucia’s mountains, through old plantation grounds, to volcanic pools, along beaches, to Cactus Valley, Pigeon Island and more.